Using Voice Commands - Can Speakerphone be Activated? Can the speakerphone be activated using voice commands? Let's say I'm in the kitchen and my hands are filthy. I have a question about what I'm cooking and want to call Grandma to get her advice (everyone's grandma is a pro in the kitchen, right?). I say "OK, Google Now. Call Grandma." At this point the phone will place the call, but my hands are still filthy. If there is not a way to enable speakerphone using voice controls, then I still have to wash my hands and pick up the phone in order to have the conversation. This essentially renders the hands-free controls useless for similar situations where I want to place a call. I would really love if there was some way to do this. Does anyone know if this has been discussed? Is it possible? cuz then i could check my voicemail with it. I think if you used Google Now to call that it would automatically activate speaker phone with it. Someone try it for us? i looked online couldn't find anything yay OR nay. I tried it earlier on my GNex. 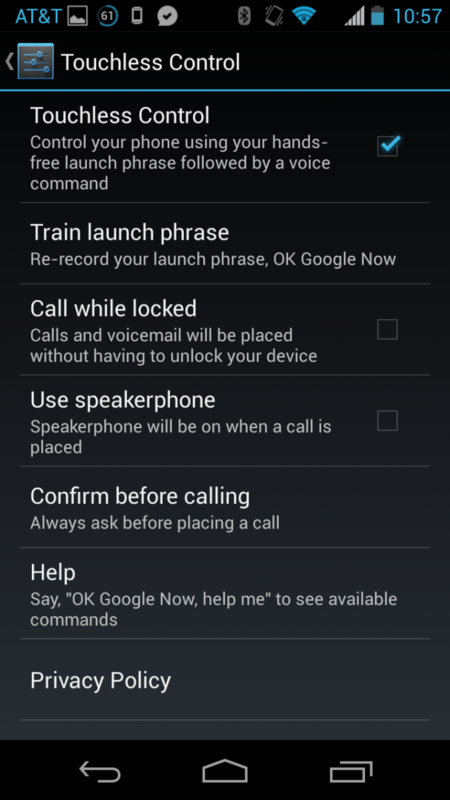 Placing a call using Google Now does not activate speakerphone. I'm wondering if Motorola added a way on the X, especially since the hands-free operation is a big selling point. I tried using Google Now on my Droid 4, speaker phone nope. I'm sure Motorola did something like that for the Moto X though. It would make sense. I think it does automatically when it senses your in a car. Yeah I've read it turns on speakerphone when in the car. I really hope they implemented it on all calls when using the voice controls. It would only make sense that if you're using voice controls you want it to be hands-free. If you call someone using Google Now (on current phones) then the call is placed as if you dialed it normally. You have to enable speakerphone manually. Thanks so much! : ). It's funny, i've read/heard more than once from reviewers saying they really like the technology, but with that feeling comes the frustration of running into it's limitations. i'm going to get very straight in my mind what it can do so that i don't run into that. Alarms, reminders, items on my calendar, writing (not sending) texts, google maps public transportation routes/times (i live in nyc), starting my music player on the phone as i'm going out the door, and a lot of times i need measurement conversions while i'm online. So i'm going to really sear that into my brain now so i don't experience what the 2 guys mentioned in their reviews. Can easily do it with tasked if it doesn't. Can you elaborate on how it works? Can you set it up to only turn on speakerphone when using the voice commands? I'm not familiar with that app, and when I search it I only find a to-do list app. Do you mean Tasker? Yes tasker, sorry autocorrect. Auto voice plugin can have a task run based on being on a call or whatever you want, where you can have a profile for a hot word like "speaker phone" or whatever you want turn that feature on through state auto recognized. Probably 5-10 min to set up and test. i so look forward to all your guys' workarounds when the phone finally gets here. I have touchlesss control working on my current device x style using tasker. I think their implementation is probably smoother though, mine can be buggy, I'd say 70-80% success rate. That sounds sweet! Thanks for the info! Hopefully Motorola implemented this as a stock option, but if not there's at least a way around it. yes you can do that, go to setting->touchless control, There is option to enable speakerphone automatically when placing a call, Enable that option ..call should be automatically put on speaker mode when calls are made using touchless control. I always have it enabled and is really usefull makes the whole experience touchless. To use speakerphone instead as a default when calling simply go to Settings -> Touchless Control -> Use Speakerphone - just check it. If you don't have a setting for Use Speakerphone, please go to the Play Store and update Touchless Control to the latest version. Aquila and chiefandrews like this. Aquila and DefectiveWeeble like this. Try auto speaker. i just downloaded today and tried it with my voicemail and it sense if the phone is placed on a flat surface to active the speakerphone, and also have face proximity to auto turn off the speakerphone. Man, you must go to Settings >Touchless Control and check "Auto Speaker Phone" option. Yes you can. Just say "call XYZ on speakerphones"
I think I've got it!!!! Say "Ok Google, Call John Smith on Speakerphone!" ......Just saw the above reply after I posted. Meh. There is an app called "newcar" it works pretty well. I went to my Google assistant and said "Call mom with speakerphone" and it worked.